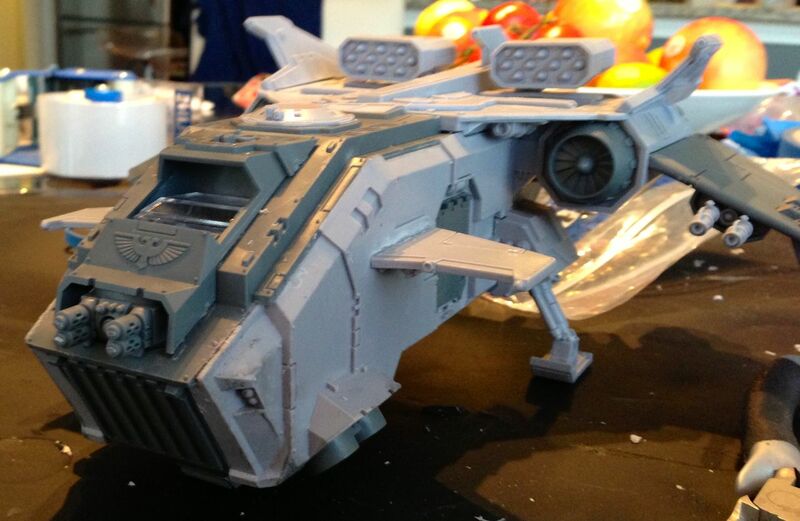 Someday I am going to have to play Apocalypse, or a really really large game of 30k. In HH, this thing can deliver a 30 man tac squad directly into battle. Too bad I haven't painted any infantry yet! The hawk has had its first pass of sponged on battle damage. 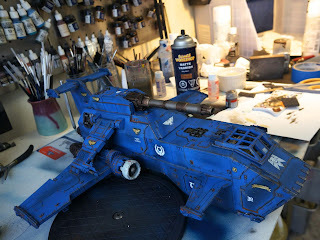 Soot colored weathering powder comes next, however I think I might pause the painting in order to get some troops built. 3 hours till hurricane landfall. Hopefully power won't go out! My Ultramarines air force is coming along nicely. 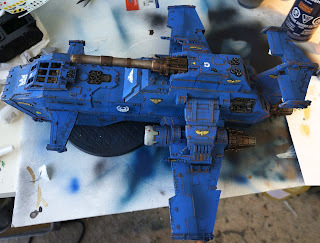 Today I managed to paint up a thunderhawk to the following stage. 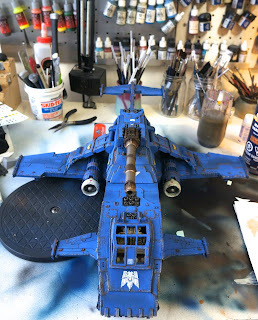 The decals are drying, and after a quick varnish, I plan to do some heavy weathering using a sponge. 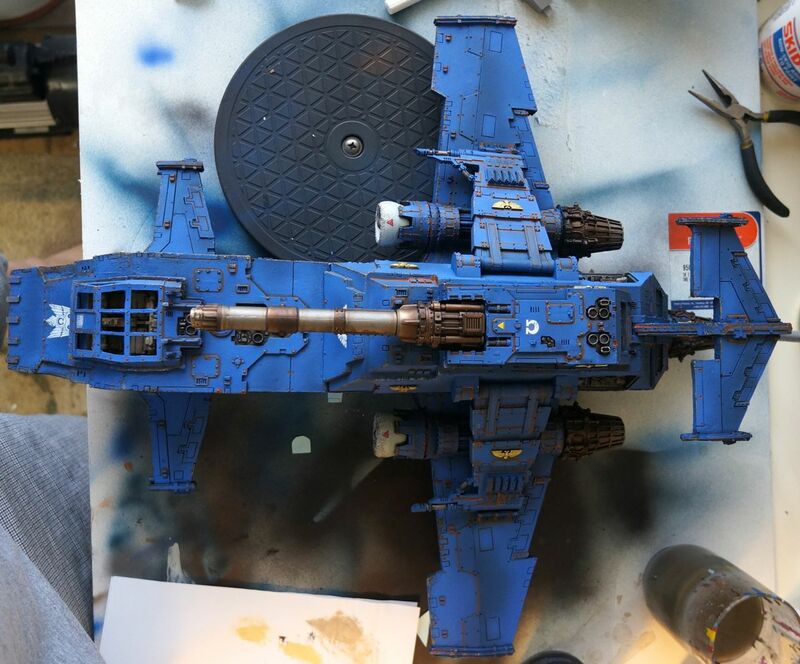 I am going to add blast damage along the sides as well. I sill think the storm eagle might look good in Emperor's Children colors. I rediscovered how much I dislike the boltgun metal replacement. Leadbelcher is just a terrible paint! I advise everyone to stay away from that stuff. Not bad for 4 hours! 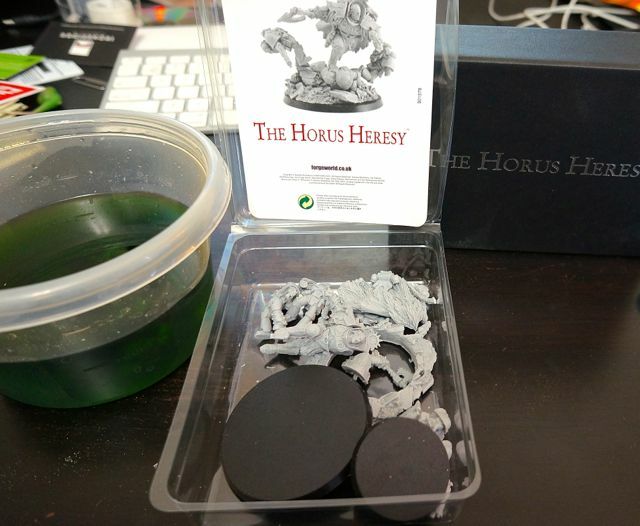 My Astral Claws finally took the big plunge prior to my wife and I going on vacation. After a whole week of soaking in Simple Green I scrubbed the models and they came out sort of chalky, leaving rough white patchy primer residue. Is there a better way to remove paint and primer from resin? Does white primer just behave this way? I normally prime with black, which does not funk up the surface when dunked. 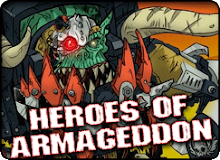 Now that these guys are cleanish, they can john their boss/ex-boss shown in the photo above. The rough texture may end up adding some interesting detail to the models. Angron is going to be fun to paint, though I think his victims present more painting fun. I love the fact that I get to paint a few legions at once. 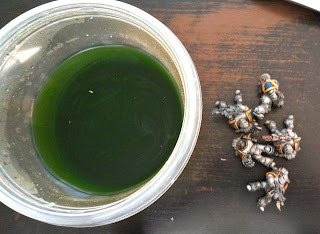 Speaking of that, anyone besides me notice that my minty colored necrons are dead ringers for sons of horus? Vallejo paint is the way to go with SoH! 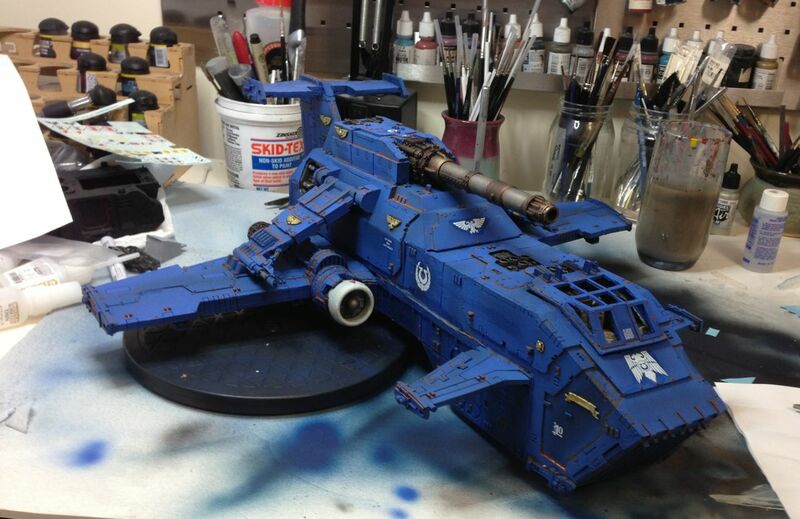 I feel lucky that my saturday quandry is whether to paint my PH force as Emperor's Children or as Ultramarines. There are so many decisions that really matter, having one that doesn't is nice. Have a great saturday before the storm everyone! This past week, my wife and I decided to do a staycation, and do all of the chores/changes/additions to our condo that had been piling up. As luck would have it the day I started re-painting our living room, was the same day the Horus Heresy book from forgeworld arrived. All week I have been reading the book before in between major house work. It turns out I have enough FW goodies to do a really nice heresy era army. Naturally the question is which army, but we'll come back to that. Today I finally had time to model. 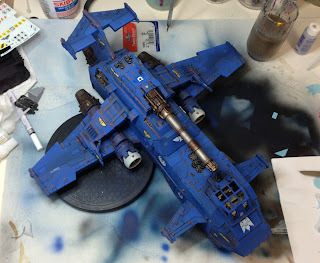 No matter what(or how many) HH army(ies) I decide to paint, the storm eagle needed to be built. It seemed like such a nice relaxing reward for all the work this week. The storm eagle is bar-none the most painful forgeworld model I have have built. It seems that nothing in the kit was straight. Between boiling water, a hair dryer, and more rubber bands and clamps than I can shake my fist at I think I managed the kit ok. I did not do a great job though, which is kind of sad given how awesome the design is. 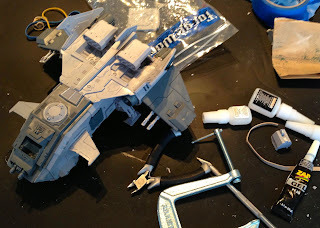 The front of the model does not fit quite right, the plastic top coming a little too forward, and the I forgot to put in the bulk head, but other than that it is mostly constructed. A few hours until all the glue is solid and I will be able to see how bad the seams really are. Paint and battle damage should cover this less than stellar build. What should I paint this up as? At the moment I am leaning towards Emperor's Children, but lacking a decal sheet or upgrade bits leaves me a little worried I could pull off all of the elaborate EC designs by hand. On the other hand, it would be really easy to paint this up to match my Ultramarine storm talons and Caestus Assault Ram. The battle of Calth is likely years away on the Horus Heresy publishing schedule, so I won't have any good reference material for Ultramarines for some time.